Lotions, Potions & Me: #44 Why!? Why!? is my skin misbehaving? #44 Why!? Why!? is my skin misbehaving? Ok I need to find a new face cream! With the turn of the weather my face is suddenly looking really flat and dull. 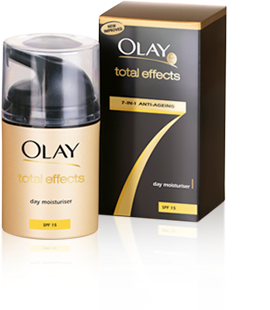 I was actually trying out Olay’s Total Effects after being swayed by an offer in Boots and unfortunately my face has decided it really hates it. I have only been using it for a couple of weeks but have realised that my face is speaking out in protest – a mini rash has started to appear (it always does that when it takes a dislike to something) its also making my face really dry with some flakiness and general dullness! After looking at my face today I thought I better stop before it brings out the big guns of breaking out all over. So does anyone have any suggestions? My skin is classic combination with some annoying open pores and a bit of scarring I’m fighting with. Let me know if there is something you use or think will be great…. really relavant right now as I'm currently using smaples from Kiehl's- the moisturiser is called "Ultra Facial Moistoriser" which is pretty good, but better at night than for day because it can be a bit oily under foundation. So far I'm really liking Burt's Bees Daytime Moisturizer with royal jelly from the Radiance Line. It's quite thick but I feel protected from the winter winds, and its not breaking me out. Perfect for flaky dry skin. I would recommend Elemis or Clarins moisturisers. Depending on your skin type, if you go to their counters, they will advise you best. I've been using the Elemis Tri Enzyme range...best ever products I've used. Thanks guys, i will definately check out all those products. I swear by Clinic. In Belgium you can ask free samples in Ici Paris XL!